Copyright �2010 PopEntertainment.com. All rights reserved. Posted: October 8, 2010. The movie version of Ned Vizzini�s popular semi-autobiographical young adult novel It�s Kind of a Funny Story is certainly different than most films that take place in a mental health facility. Instead of a dark and upsetting look at the world, It�s Kind of a Funny Story is a rather upbeat story, in which an overwhelmed teen (played in his first starring role by Keir Gilchrist of The United States of Tara) commits himself after having dreams of suicide, only to find friendship, self-confidence and even love in the hospital. Therefore it only makes sense that the people who were making the film were stepping out on a ledge to go against type as well. Take, for example Zach Galifianakis, who plays the important role of Bobby, an aging patient who assigns himself the guardian for the teen. Galifianakis is hot off his breakthrough role in last summer�s hit comedy The Hangover, however, he is known for broad comic relief in films like Dinner for Schmucks, Youth in Revolt, What Happens in Vegas and the upcoming Due Date. While his character here has some very funny moments, Galifianakis� acting is even more notable for the balancing act between humor and dramatic tension. Also going against type are former child actress Emma Roberts as the kid�s potential love interest, Oscar Nominee Viola Davis as an empathetic doctor and Lauren Graham and Jim Gaffigan as self-obsessed parents. 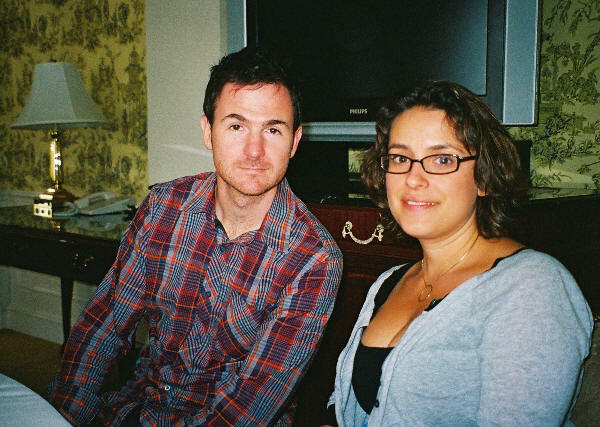 Or, there is the writing and directing team of Anna Boden and Ryan Fleck. The two have previously made the acclaimed films Half Nelson and Sugar, both of which had darker storylines. However they show a light touch in the new film which is surprising and fun. A couple of weeks before It�s Kind of a Funny Story was to be released, we were able to take part in an intimate round table discussion with actor Zach Galifianakis and co-writer/directors Ryan Fleck and Anna Boden at the Waldorf-Astoria Hotel in New York. Will we become material in some routine in the future as a result? Zach Galifianakis: Well I have a talk show kind of based on press junkets called �Between Two Ferns,� so that�s kind of how it came about. I imagine a fantasy of an interviewer being able to ask terrible, rude questions. 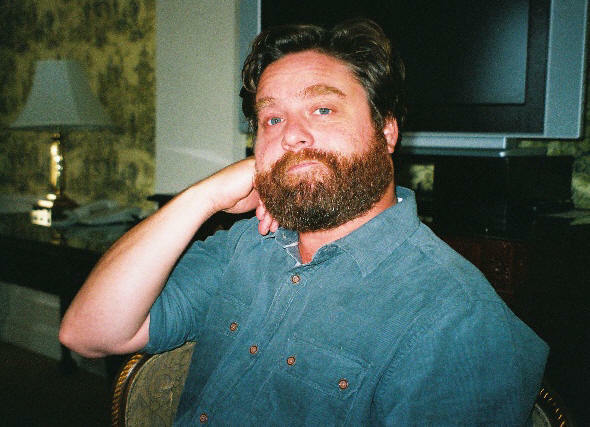 Zach Galifianakis: I�ve heard them all. This was certainly a lighter look at mental health institutions than, say, One Flew Over the Cuckoo�s Nest. Were you trying to show the more positive aspects? Ryan Fleck: That comes from the book. We got a hold of the book and really just thought it was fun and had serious themes. We were laughing while we were reading it. We thought, oh we can see how this could work � a movie that�s playful and yet dramatic at the same time. Cuckoo�s Nest is obviously the looming great mental hospital movie out there. Were there certain films that you looked at prior and said "that�s been done?" Or was there anything that you looked at and said "that�s an idea we can extrapolate upon?" Anna Boden: Not actually in the mental health arena. Of course we�ve both seen Cuckoo�s Nest. It�s one of the great movies. We didn�t look to it as an inspiration for this film. It felt from the very beginning like they were completely different looks at what was ultimately a completely different kind of an institution, even though they are both mental health facilities. Zach Galifianakis: I think I was tempted to look at One Flew Over the Cuckoo�s Nest but then I decided not to do it because subconsciously you might take something that you don�t want to. Ryan Fleck: We looked at Breakfast Club a lot, because of it being confined in one location, so much of that movie. We really knew that a lot of this was going to be in the hospital. Trying to be that fresh and original. We looked at some movies like Election and Clueless. The movie is about the experiences of the modern teenager. Did your own experiences as teens really draw you into doing the movie? Anna Boden: Yeah, I felt like I could really relate to the character that I was reading in that book � and the one that we eventually portrayed onscreen, both as a teenager and (chuckles) as an adult, embarrassingly: self-consciousness and insecurity and all the pressures. There are definitely special stresses that teenagers deal with these days that I didn�t have to deal with. The world is in a much scarier place. With the technology, it feels like all those stresses are accelerated, in sometimes painful ways. So how much did this remind you of your high school days? Zach Galifianakis: The movie? I don�t think there�s any comparison. My high school, I mean there were a lot of mental, mental people there for sure, but other than that I don�t compare it. I was reading that you were trying to make the movie in the style of a modern John Hughes film. How much as filmmakers did he inspire your work? Ryan Fleck: � right. Scorcese. All these cinema guys. We�d forget about who had the initial influence on you when you were twelve years old. It was these movies � Breakfast Club and Ferris Bueller�s Day Off. Ryan Fleck: Sixteen Candles. And Pretty in Pink. Those had huge impacts. When you thinking about making serious films, you forget about the impacts those had on you. We really went back and watched them and got really excited about making something in that tradition. Zach Galifianakis: Anne and Ryan never said to me that they were going for a John Hughes anything so I think if you just kind of look at it as the work experience like I said, I don�t really over think it. I draw on what I know inside of me, which is not a lot. Did you go back and look at Harold and Maude? Anna Boden: An unusual friendship? Did you ever see King of Hearts? Zach Galifianakis: I don�t know what that is. It�s a great film from the 60s about an insane asylum with Alan Bates. 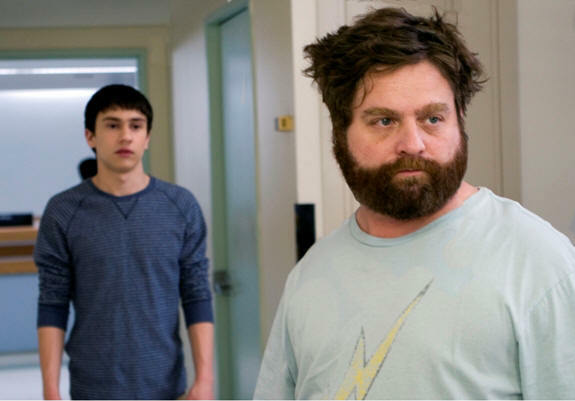 Zach Galifianakis: I love insane asylum movies. I love prison movies. I love when they�re specific like that. I do. You certainly went a little far afield from your previous films, having fun with the cinematography and editing. That�s why I thought Harold and Maude. It really was a change, I remember thinking here�s the people who did Half Nelson�. Ryan Fleck: Yeah, we embraced the opportunity to do something totally different. It�s funny, we only made two movies and people think it�s such a departure. (Anna laughs) Could you imagine if we made a third really serious film? If we ever wanted to do something different, we�d be sitting here and you guys would think it would be very strange. But it�s just two movies. We thought it was time to do something really fun and really play with the tools of cinema. Have fun. Have a musical number. Move the camera a little bit more. Really get inside the character�s head. After having done so many comic roles was it interesting to have a more dramatic role? Was it hard to go into the dramatic parts? Zach Galifianakis: It wasn�t difficult actually at all. I�ve said this and I don�t know what it means but this character is the most like I am than any other character that I�ve had to play, which isn�t speaking too highly about myself. Aside from the suicide stuff and all that, I think just because of the tone of the movie it�s more kind of real, at least in the dialogue back and forth between the characters. It wasn�t that difficult, and real funny is very hard to play. It�s very difficult; people don�t realize that it�s a lot of work to try to make a bunch of people laugh. So it wasn�t that bad. When did Zach come aboard the film? Ryan Fleck: We wrote the first draft back in 2006, around the time Half Nelson came out. We were still prepping Sugar at that time and then put the script away for a little while. Leadership at Paramount changed over. That�s where we originally wrote it. We never really got as far as the casting process in those early draft stages. Then Focus revitalized it and that was around the time Hangover came out. Kevin Misher, one our producers, said, �Hey, go check out this movie.� He knew Zach personally and said he could give him the script. We saw The Hangover and thought, oh, that�s a really funny movie. We didn�t necessarily see much of Bobby in Zach at that time. But we met with Zach and had a few drinks and he�s such a warm, friendly, nice, smart guy. Not like the characters I�d seen in his stand-up or his other movies. So we thought if he could bring some of himself into this role and combine that with the more certain creepy elements of this other characters that it would be something really fresh that audiences hadn�t seen. You still get the humor that he pulls off really wonderfully, but he also calms down and makes it much more relatable. 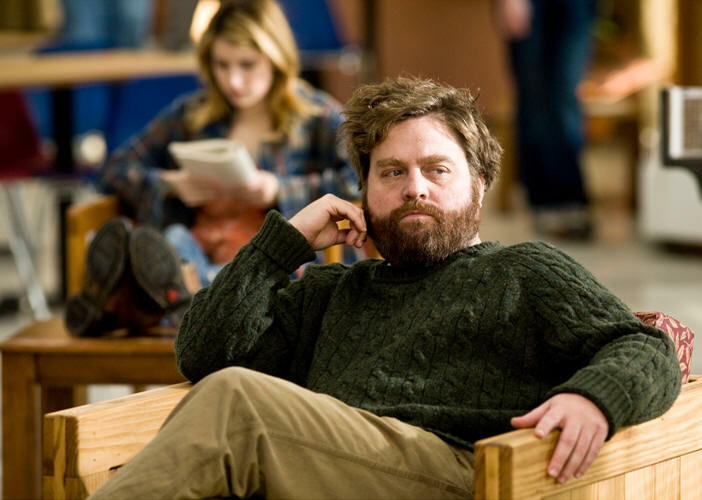 Zach Galifianakis: I met with Anna and Ryan to discuss it after reading the script. We went to have some beers and after a few Belgian beers I tricked them into liking me. Having seen their other movies I really wanted to do it, and we just discussed the tone of it and what they wanted to do. I had to ask �How funny do you want to make it?� They said �Not that funny, but not that melodramatic as well.� They wanted to strike this balance and I was interested in doing a story where it wasn�t so over the top crazy comedy, which I was coming out of. So that�s how I got involved. Since he came from stand-up, were there certain scenes where you said he could improvise a bit? Anna Boden: Yeah. One of the scenes that has most of that, I�d say, was the first half of that scene on the basketball court between Keir (Gilchrist) and Zach. He was pretending to be Noelle (Emma Robert�s character) and having him practice asking her out on a date. We really asked him to go off on that, because we also had two cameras that day, which is fantastic � to be able to be shooting Keir�s response to him. We really wanted him to surprise Keir, and it�s fun to watch Keir trying to keep up with Zach. There�s that moment where he says, �Try a little flirtation in the beginning.� Keir just really can�t hold it together. He�s like, �I don�t know what you mean by that!� It kind of worked for his character as well and ended up in the movie. Another place is when they are at the lunch table and he�s listing off things that are propaganda � they�re telling you that you need all that stuff. He just goes on and on. You should check out the DVD outtakes, because there�s a lot that we couldn�t put in there that he really had a lot of fun with [in] that scene, listing off crazy stuff. 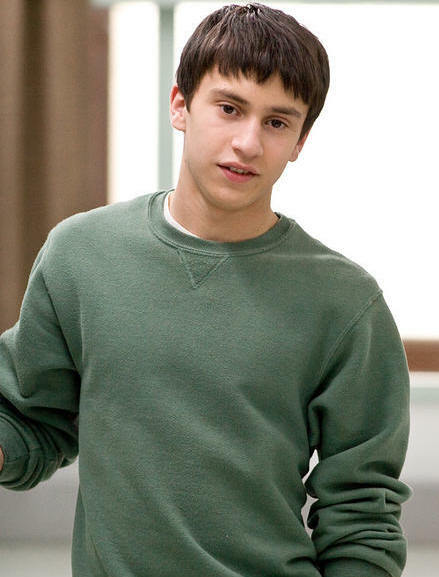 With the film focusing so much on Keir, it must have been a challenge to find the right actor. Ryan Fleck: Yeah. Yeah. It was important to us that we had a real teenager in that part. It�s so much intrinsic of the story � what teens are going through. We didn�t want to put in a 22 year old pretending to play a 16 year old. Keir is 17 and very much going through similar issues. He sent in an audition tape that we really enjoyed. Even at that early stage, he was far beyond anybody else we would meet. Then we met with him and saw that he�s just a kid, you know? He�s a tough little kid. There a scene you have in the movie where your character totally breaks down and it�s a really remarkable scene. I�m just wondering what was going through your mind? How many times had you rehearsed it? Had you rehearsed it alone? Had you rehearsed it with directors? Did you kind of wing it? Zach Galifianakis: I talked to the directors about it. I wanted to know what the gravity of it was and how explosive they needed it. From my kind of self-taught acting school in my head, which is hard to get into (laughs), you develop a coordination of past thoughts and past emotions. They probably teach you that in some acting class in acting schools, but I am able to do that for some reason. That is probably based on some kind of rage that I�ve had. I don�t think too much of it really. It�s just kind of push a button and it happens and you kind of Zen out. I don�t like to over think things too much in life in general because I find it can get it in the way. But I did draw on something in the past, because I�ve been that angry before. Not often, but when I get mad I get that mad. (laughs) That�s embarrassing. I can�t believe I just admitted that. It�s a cool scene because you�ve seen people flip out in movies a hundred times but it seemed very real. Zach Galifianakis: We probably shot a couple where it seemed [over the top]. The filmmakers probably chose the right cuts for it. It�s fun to do that. To do that kind of a physical� you just have this thing. I really was out of breath; I mean it takes a lot of energy to do it and to do it several times. I�ve done it before in a movie. I�ve done it in another movie where I had a rage like that. It�s just fun to do. What about the scene where your ex-wife and daughter are there where you really aren�t able to say much of anything but you�ve got to get across so many emotions while this is going on? Was that difficult to do? Zach Galifianakis: This is what I like about Anna and Ryan. What I think I like in certain movies is the non-verbal aspect. 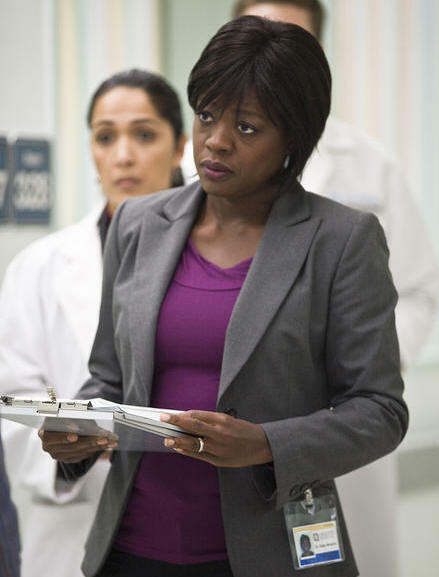 I don�t think I say much in that scene at all and I think you can just read on the face. This conversation that he�s having with his wife, I just knew that I wanted to make it look like he�s had it a thousand times. He�s heard this a thousand times, so it wasn�t new to him. There was not much he could say because he already knows that whatever he says is not going to work, and she�s a pretty belligerent woman in that speech, so I think saying nothing says a lot. Was there anything in particular that pulled you into the book for this film? Anna Boden: It was the lead character. I got really excited. First of all, I love this kind of movie. I love teen movies. I love John Hughes movies. We made two very different kind of movies at the beginning, but we�re both big fans of this kind of film. To have a lead character who is not cynical, not sarcastic. He doesn�t have that obnoxious sense of irony that I see so often in teen film and TV these days. That was really exciting. To see somebody who was so open to the world that could be put in a situation and meet people that he never otherwise have the opportunity to meet in his life. And really allow them to change him and change his perspective on his own problems. That�s what caught me. Did you worry at all about the tone making problems of mental health seem too much fun? Ryan Fleck: We had Ned�s book to guide us through all of that. 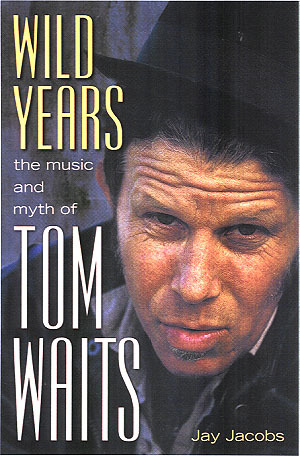 His book is very loosely based on the experience that he had, so he is very familiar with this. I thought that he balanced that line really well in his book. We had that as our blueprint to get us through those tricky parts. Was he on the set at all? Ryan Fleck: He came to visit, yeah. He was very supportive. He wasn�t involved with the script at all, but he came by a few times and he was one of the first people to see the movie and he really loved it. I really felt good about that. The film carries with it a message of seize the day and live in the present as a way to find meaning in life. How do you find meaning in your own life? Zach Galifianakis: I am a believer in �live for the day.� I don�t necessarily live for the future and I find those that live in the past their best days are over. You know, when you go back to your home town or something and there are still people taking about high school so much. I�m like, there�s more to life than high school. It was not the pinnacle of your life. There�s this guy that�s made a lot of money, Eckhart Tolle, who goes around and preaches that. Then I listened to some of his book and I was like yeah, I already do it. That�s how I do it, Eckhart. Were you not able to use any actual hospitals? Anna Boden: To use an actual mental health facility? Shoot in one, actually? We scouted a couple of regular functioning mental health facilities. None of them were going to work quite as well as this, because we had two floors that were totally vacant, all to ourselves. We really could do what we wanted with it and give it the kind of light, warm feel that we thought we thought was, as Ryan said, reflected in Ned Vizzini�s book. How about patients? Was it hard to get it authentic? Anna Boden: It was very important for us to get the patients as they were portrayed in Ned�s novel correctly. This is certainly not a gritty documentary look at what it�s like inside a mental health facility. That�s certainly not what we were going for. Do you have friends that have gone through an experience like this at one time or another? 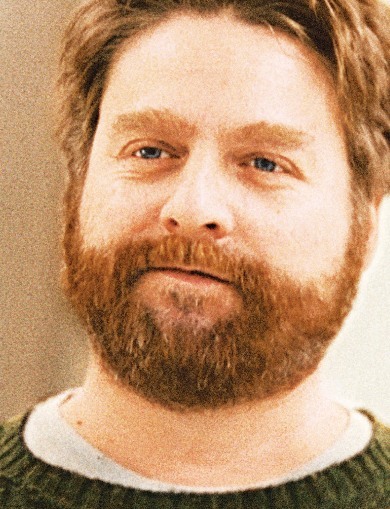 Zach Galifianakis: I do. I have visited a couple of friends. One of them, and I�m not going to reveal who it is, is actually in this movie. In the entertainment business there�s a gravitational pull towards people that are fucked up already and then the business kind of makes them more screwed up. I went and visited a couple of places myself when I was researching this. I don�t want to come across as some sort of method, researcher, actor-y type, but I felt like I had to do it for this movie to give it its due diligence. In your research for this film did you find any patients that weren�t able to actually get out? Zach Galifianakis: No, but the ones I observed I thought could live on the other side and were going to get out, the ones I kind of based this character on. They seemed very functioning, and I think Bobby seems very functioning, but they also had something behind their eyes that seemed like they could snap. But Bobby was able to go out and get ice cream and things. Zach Galifianakis: I think Bobby snuck out. The ice cream thing, he probably took the doctor�s uniform on and snuck out. I don�t think that was permission. So you didn�t find any patients that could actually sneak out? Zach Galifianakis: No, well in the state facilities there�s no way. One of them was a half-way house so I think there was little bit of you can come and go and it�s kind of up to you to show up. Did you do any parts of the film that were not from the book? Ryan Fleck: Oh yeah. Oh yeah. The �Under Pressure� sequence, for one. There�s a lot more characters that Craig encounters in the hospital [in the book] that we didn�t have screen time for. We sort of condensed them. Bobby is very much a combination of two or three characters from the book. Anna Boden: I think that Zach�s character and performance in it � even though he was very charming and fun and silly � does add a little bit of that gravitas to the situation. He really gets across that there is something going on under the surface that�s a little bit darker than what Craig might be going through. So what sort of advice would you give to the character of Bobby if you met Bobby somewhere? I�m going to go look that up. Zach Galifianakis: You could do it. It�s very Google-able. What would I say to Bobby? I think Bobby is one of those guys that probably needs help help more than Craig, so I think he may need those drugs. I don�t know, I think those drugs can eventually hurt a person. I don�t know if this works, but a lot of people think they have it bad, and a lot of it is chemical, but a lot of it is self-pity and maybe he�s guilty of that a little bit. There are a lot of things you can do if you�re feeling sorry for yourself and you�re not chemical. How much fun was it to do the �Under Pressure� musical sequence? Anna Boden: I�d say like a 9.5. It was really fun. It was like our second to last day of shooting and all the departments were just so excited about this particular scene and prepared throughout the entire shoot. Throughout all our costumes and production design. Our actors were super excited about it. They were listening to �Under Pressure� over and over again. To get on set and have all of those different elements come together in a really fluent way � I�m just so glad we picked such an amazing song. (laughs) I couldn�t imagine having to listen to a worse song over and over and over again that day. But it was fun. Not only did we not get sick of it, but that night we all went to a bar afterwards to celebrate and Zach put �Under Pressure� on at the bar. He hadn�t gotten enough of it. Anna Boden: No, he didn�t. Are you going to send a copy to Bowie? Ryan Fleck: Boy, do you know anybody? I�d love that. Zach Galifianakis: Yeah, I would like to know what he has to say about that. Hopefully he�ll see the movie. Yeah, I never thought about that. And hopefully Freddie Mercury�s looking down from wherever he is, or looking sideways and up, and likes it too. Did you think of getting Bowie in for a cameo? Anna Boden: Zoolander already did that. Were vocals in that scene done by the cast members? Anna Boden: No, it�s pretty much all the original recording, but we did record a couple takes where they sang without the song. We recorded their voices and tried to mix it in very subtly. So, sometimes when there are two people singing you�ll hear Noelle�s voice � a female voice � just to give it a little texture and flavor of the real actors. But it�s mostly the song. If you could go back in time and jam on stage with any band what would it be? Zach Galifianakis: Mormon Tabernacle Choir. Zach Galifianakis: Yeah, that�s doable. I�d like to jam out with them. I�ve actually been on stage with a band, My Morning Jacket. I did a little performance thing with them which was really fun because it was a five hour concert and I was there for their last song. But yeah, I think I would like to be in the Mormon Tabernacle Choir. As a comedian, did you enjoy a more serious, dramatic role? Could you see yourself crossing over like Robin Williams in Good Will Hunting? Zach Galifianakis: Yes, I really do enjoy it. It�s sometimes kind of unfair for comics. There are a lot of regular actors that do comedy and that�s allowed, but for some reason a comedian trying to do a straight thing is seen as strange. I just want to change it up and do as much as I can do and challenge myself, and if that means a more dramatic thing I just want to work. I feel very, very lucky to be working, so if it�s something different that�s very helpful for me. I might do a soap opera after this. The one scene where he suffers a breakdown was, I thought, really impressive. When he said if you�re here when your daughter is celebrating her eighth birthday, I�ll come back and kill you. But, the other sort of devil�s advocate question is this is sort of an oversensitive upper class kid. How confident were you that nobody would think that no one will think his problems aren�t really that bad? Anna Boden: You know, you were talking about the John Hughes films. We tried to kind of approach him on his own terms. It�s easy, maybe, for an adult to look back on that time in your life and especially if you grow up in a privileged way and say, �Oh, your problems aren�t all that bad.� But it doesn�t feel that way when you are that age. Certainly depression isn�t something that only a certain portion of the population goes through. So, I guess, what the story does have is that sense that his perspective on his father was due change. There is something that is really empowering about that � to start realizing all the things that you have and start being able to appreciate them and want to actually go out and live � that attracted me to the character. You have a remarkable cast with some pretty interesting supporting actors here, like Lauren Graham, Emma Roberts, Zach, Viola Davis and Jim Gaffigan. What were the challenges of putting the whole team together? Ryan Fleck: We got very lucky. People turned up and they read the script and they were excited to do the movie. We were very lucky. People from all different backgrounds. Our first two movies had a lot of non-actors. This one was all SAG (Screen Actors� Guild). All very experienced actors, from the background people to everybody. So it was great. 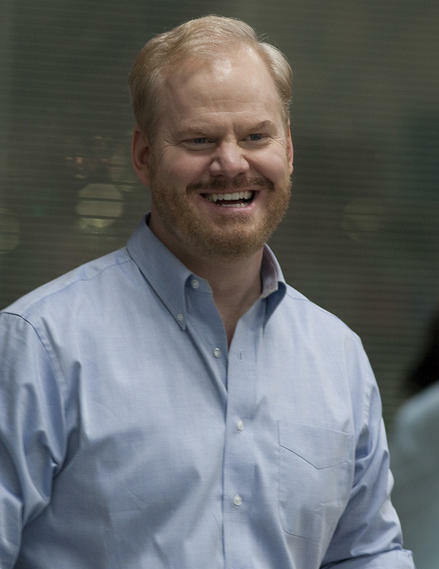 Even though they didn�t have any scenes together, did Zach and Jim [Gaffigan] know each other? Did they have any funny exchanges? Ryan Fleck: Not that I witnessed. Anna Boden: All their funny moments happened upstairs in the cast room. I was curious about the scene on the rooftop, where it kind of freezes on Craig and says �This is for the second part.� Does that mean that Craig has been telling the story the whole time? Also, were you worried about doing that scene? Did you film it first and worry it didn�t fit? Ryan Fleck: It was more of a writing scene. It doesn�t take place on the rooftop, but there was a bonding scene with Craig and Noelle in the book. It goes on for a while and it�s beautifully written in a novel, but when you actually have to get actors saying that kind of stuff, we were like well, let�s get these happy moments and move on. It was sort of a stylistic way to get us through that and still have the bonding, but without it feeling too precious. How about the animation with the brain maps? Who did them and how interesting were they to use as a filmmaker? Ryan Fleck: That was fun. That was one of the things initially when we read the book that we loved, because we saw how it allowed for more stylistic moments. The animation is such an important part to him, how he learns his experience in the hospital. How he learns who he is. The artist who created those drawings, Brian Drucker, he also was an animator. So he was able to animate his own work, which was nice to have that connection through it. Would you say there is a common thread between all of your movies? Anna Boden: I don�t know. We approached every one very differently and the honest truth is that we could come up with a bunch of answers about what is a common thread, but we only came up with them after being asked the question. It�s not something we thought about going into the movies. What did you learn by asking the question to yourself? What did you see in it? Ryan Fleck: I guess there are young people who are struggling with a complicated world to make decisions to move forward. Did you see an odd relationship between this character and the Dinner for Schmucks character in the sense that they�re two different kinds of madness? Zach Galifianakis: I think I�ve kind of cornered that weird market. This is a very real weird though. I don�t want to say weird; stressed thing. I don�t think Bobby�s weird at all actually; I think he�s just a little sick. But as far as the other characters I think the one common factor is that you don�t want to necessarily bring him home to dinner, in all the characters. Looking forward to a fourth project, do you have anything you�re doing? Ryan Fleck: Not yet. We�re starting some original stuff and we�ll see how that goes. Figure it out later. Anything happening with that Cuban hip hop thing? Ryan Fleck: It played in Europe and Japan on TV. Are you going to revisit the interview show? Zach Galifianakis: I had a regular talk show. No, I kind of fulfill that with my internet talk show, so no. I was very bad at it. I was very bad and plus I was eating a lot of pot cookies. Can we talk briefly about Thailand, The Hangover 2? Did that shoot yet? Zach Galifianakis: It starts shooting in a couple weeks. Where we�re going I don�t know. But it�s set in Thailand. The movie�s set in Thailand. Zach Galifianakis: Is that what they say? I don�t know; I�ve got to read the script. Zach Galifianakis: Oh that has been officially announced? Oh, okay. I�ll let whoever officially announced that [discuss it]� Because, who was the official? The President of Thailand or something? I�m told that the story takes place in Thailand. Whether or not you�re shooting in Thailand I don�t know. Zach Galifianakis: There was social upheaval early in the summer in Thailand. I will screw up any kind of official thing and I�ll just get a phone call and then I just have to go, �I don�t know. Some nice man was asking me a question.� What I find is, and I don�t really read a lot of stuff, but you say something to a reporter, it shockingly ends up reported. And I forget. So I�ve had to edit certain things. I�m not as free as I used to be because I have to do edits constantly. What else is coming up that you can talk about? 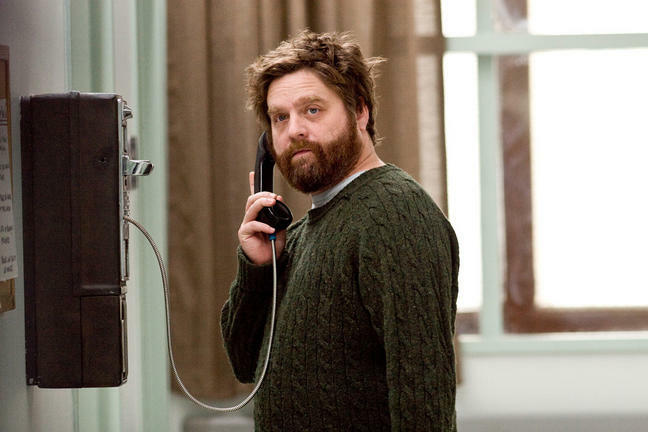 Zach Galifianakis: I know there is a movie that is coming up for sure, and it�s called Due Date. It comes out November 5th. #1 � 2010 Jay S. Jacobs. All rights reserved. #2 � 2010 Jay S. Jacobs. All rights reserved. #3 � 2010 KC Bailey. Courtesy of Focus Features. All rights reserved. #4 � 2010 KC Bailey. Courtesy of Focus Features. All rights reserved. #5 � 2010 KC Bailey. Courtesy of Focus Features. All rights reserved. #6 � 2010 KC Bailey. Courtesy of Focus Features. All rights reserved. #7 � 2010 KC Bailey. Courtesy of Focus Features. All rights reserved. #8 � 2010 KC Bailey. Courtesy of Focus Features. All rights reserved. #9 � 2010 KC Bailey. Courtesy of Focus Features. All rights reserved. #10 � 2010 KC Bailey. Courtesy of Focus Features. All rights reserved. #11 � 2010 KC Bailey. Courtesy of Focus Features. All rights reserved. #12 � 2010 KC Bailey. Courtesy of Focus Features. All rights reserved. #13 � 2010 KC Bailey. Courtesy of Focus Features. All rights reserved. #14 � 2010 KC Bailey. Courtesy of Focus Features. All rights reserved.